People know, like and trust the opinions of their friends and family. Wouldn't it be great if your customers were telling all of their friends and family how great you are? 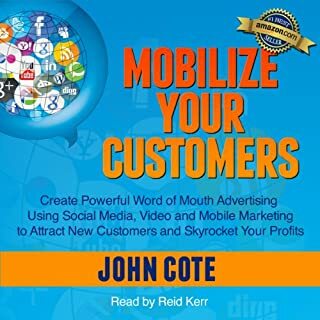 In this audiobook, John Cote reveals the techniques he uses to help his clients find more customers, follow up with them and generate more revenue in their business. Inspired by the many conversations he has with business owners, he will help you discover how to effectively use social media, video and mobile marketing. What would have made Mobilize Your Customers better? This book does have some nuggets of useful information. But it's a long, extended ad/webinar for the author's business. I also found the snake-oil-salesman language used in the book.